As always, with all of the good points, a lease comes with its own constraints as well. Things such as a fixed term and mileage constraints, as well as the hassles in returning the car back to the dealer at lease end. 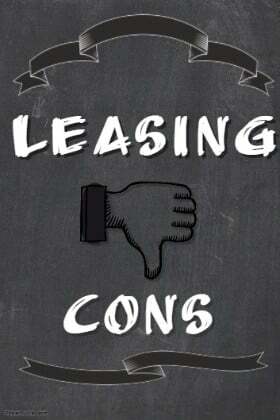 This section of the leasing guide will go through all of the most important disadvantages to leasing when comparing to the other purchasing options. First, let's have a look at these in point form for easy viewing, then, if you want to learn more about each, we go into further detail at the bottom of this section. Long Term Value - At the end of the lease, you have little equity in the car and, in most cases, will find it easier to simply return it to the dealership, leaving you with little to show for your payments. Mileage and Condition Limits - You can only drive so many miles over the duration of your lease, with a penalty if you go over. There are also limits on how much wear and tear is considered acceptable. Less Customizable - Only a limited selection of customization options are allowed on a lease, limiting the options for visual or performance improvements. Offers Vary a Lot - Unlike financing offers, lease deals can be both varied and volatile. Similar cars can have very different lease payments, and the payments can fluctuate a lot depending on the markets and even the time of the year. Hard to End Early - The leasing company expects you to see the entire lease through to the end, and can impose hefty penalties for ending the lease early. Few Finance and Insurance Choices - Each car brand often has only one leasing company that it works with, making it your only choice if you want to lease one of their cars. Leases also tend to require relatively comprehensive insurance packages, which means you may have to update your policy or choose a different insurance company. The biggest reason not to choose a lease over a finance is that at the end of the lease, you have to return the car back to the leasing company and are left with nothing to show for the payments you’ve made. That is not a problem if you are in the habit of regularly upgrading your vehicle, but if you are looking to maximize the value you get out of your investment, a lease will fall far short of financing the same vehicle. Modern cars are very well made, and tend to continue running well for over ten years or more if they are regularly maintained. As such, five or six years of financing a car can easily turn into more than a decade of car ownership. 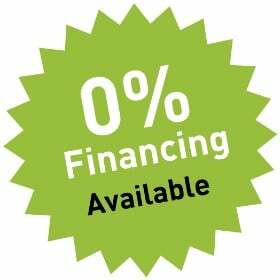 Financing a brand new car can also come with special low finance rates, going as low as 0%. That allows you to make a long-term investment in your vehicle without paying extra for it. There is no such thing as interest-free leasing, as all leases come with finance charges. And if you choose to buy out your vehicle after the end of the lease, you have to finance it as a pre-owned vehicle, which comes with much higher interest rates than a new vehicle as well. Overall, if you are looking to own one car for longer than four or five years, then financing or buying it outright is a much better deal over time than leasing. If you own or finance a car, you are its owner and can use it as you wish, but leasing a car comes with some rules on how you can use it. All leases come with a maximum mileage, usually around 12,000 or 15,000 miles per year. While for many drivers, this amount is easily sufficient, it can be easy to run up against the limits of your lease if you have a long daily commute or enjoy long road trips on a regular basis. How many miles you expect to drive annually is an important thing to consider before entering into a lease. If your driving habits change, you might be forced to start budgeting your mileage to avoid running into over-mileage charges at the end of the lease. That can significantly limit your freedom to use your car as you want. Additionally, you are responsible for keeping your car in good condition for the duration of the lease. Again, most drivers will not find these conditions to be too restrictive, but it can limit the activities that you can use the car for. If you smoke or have pets, you have to be careful to take extra care when cleaning your car afterwards. Some leasing agreements will add additional cleaning fees at the end of the lease if it seems like you regularly smoked or had pets in your car. Similarly, more extreme activities like off-roading can scratch up or otherwise damage the car, which you can then be charged for at the end of the lease. Most people find the mileage and condition limits of a lease to fit well with how they plan to use their car. However, if you want the freedom to use your car as you want, then some conditions that a lease imposes can feel restrictive or can limit your enjoyment of your car. 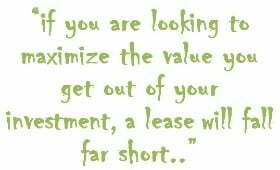 In that case, a lease may not be preferable compared to financing. Leasing companies heavily limit the kind of modifications and customizations that you can make to your vehicles while you are leasing it. The standard end to any lease involves the lessee returning the car back to the leasing company. For the leasing company, that means that they want to receive a car that is relatively easy for them to auction off to a dealership, which can then sell it as a used car. Since it is more difficult to resell heavily customized cars, modifications are heavily restricted on leased cars. Only dealer-installed accessories approved by the manufacturer are allowed, with many of the performance upgrades off limits even then. Aftermarket parts, self-installed accessories and even custom paint jobs are also prohibited by most leasing agreements. If your plans for your car include personalizing it by adding or replacing components, even purely visual ones, then a lease will considerably limit how much and what kind of changes you can make to your car. In that case, a lease may not be the right choice. If you enjoy customizing your car, be sure to check the list of dealer-installed accessories available to see if they are sufficient for your needs before leasing your car. Because leasing depends a lot on not just the currently prevailing interest rates and available special offers, but also on guesses regarding the future value of the car you are leasing, the leasing deals available on even very similar vehicles can be very different. This can sometimes force you to make tradeoffs when leasing that are not a problem if you are financing your car. For example, you might prefer one brand of sedan thanks to its better specifications or equipment options, only to find that leasing it would cost significantly more than leasing a more expensive vehicle that is less attractive to you. In some cases, leases may not be available at all on certain models or trim levels. Leasing deals and offers can also change significantly depending on the economic situation. Changes in loan interest rates or forecasts for the used car market can mean big increases or decreases in lease payments offered. Lease deals also tend to change depending on time of the year, with freshly released cars often sporting the best offers. That can mean that sometimes making full use of the advantages of leasing requires you to pick your second or third choice of vehicle. Because of the nature of the lease contract, it can be hard to get out of your lease early should you find yourself in a position where the lease does not make sense to you any longer. 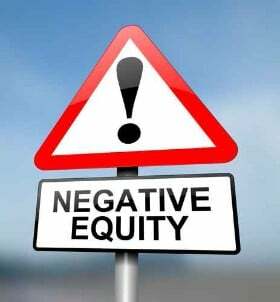 Because you are only making relatively small payments, unless you put a significant amount of money down at the start of the lease, you will have negative equity for the majority of the lease duration. Because you owe more money on the car than the car itself is worth until pretty much the end of the lease term, it can be difficult to trade it in early. Likewise, simply buying the lease out early, should you choose to do so, also comes with difficulties and, often, financial penalties from the leasing company. While a lease may provide extra flexibility through its short term nature, it is far less flexible than a finance agreement for the duration of that term. Before you decide on a lease, make sure that you are not likely to need to get out of it halfway through, as that can be very problematic. Leasing locks you into certain financing and insurance options, with little choice available. Leases are usually only available from the manufacturer’s captive or affiliated leasing company, which means that once you’ve selected a vehicle, it is almost impossible to shop around for better rates or conditions with a lease the same way you can with a conventional finance. Leasing also comes with some hefty insurance requirements. You are required to have full protection for the car itself, as well as gap insurance to cover the difference between the value of the car and the amount you owe on the lease in case of an accident. These requirements can often force you to work with a bank or insurance company that you may not like or limit your ability to shop around for deals.